DETROIT, MI [COCC] -- The Council of Orthodox Christian Churches, together with the St. John Chrysostom Clergy Brotherhood of Metropolitan Detroit, ask your prayers and support for Fr. 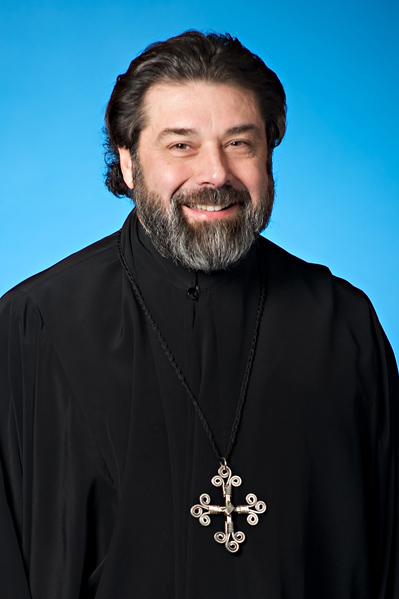 Dimitrie Vincent, parish priest of St. Thomas the Apostle Orthodox Church in Farmington Hills. He also serves as the clergy liaison/spiritual advisor for Detroit's Own Orthodox Radio (DOOR) and can occasionally be heard conducting on-air interviews. Having suffered a serious spinal cord injury while playing hockey on November 25, Fr. Dimitrie underwent emergency surgery and has been recovering at the Rehabilitation Institute of Michigan in Detroit. He is in good spirits and determined to recover from this setback, but will require extensive ongoing physical therapy. Hockey has Heart, a 501(c)(3) organization that assists hockey players who experience serious accidents and illnesses, is requesting donations to assist Fr. Dimitrie with his ongoing care. Medical expenses for these types of injuries can be significant. 100% of the funds raised will be passed directly to him, as any processing fees will be absorbed by the HHH general fund. Members of the local Orthodox Christian community are encouraged to contribute to this worthy cause. CLICK HERE to go to the Hockey has Heart website, click on DONATE NOW and follow the prompts. Please be sure to include the message "Father D" in the special instructions box. UPDATE (1/23/18): CLICK HERE to see a report from Detroit's NBC affiliate, WDIV Local 4, about Fr. Dimitrie's road to recovery. UPDATE (2/21/18): CLICK HERE to see a report from Detroit's FOX affiliate, WJBK Fox 2, about Fr. Dimitrie's road to recovery.